(Photo: Tom Casino/SHOWTIME) By Allan Fox: Unbeaten #1 WBC Ajose Olusegun (30-0, 14 KO’s) says he’s not worried at all about the power of #2 WBC Lucas Matthysse (31-2, 29 KO’s) in their fight this Saturday night on Showtime at the Hard Rock Hotel and Casino, The Joint, in Las Vegas, Nevada. Olusegun, 32, feels he’ll be able to take any big power shot that the 29-year-old Matthysse hits him with and then return fire on him. Matthysse doesn’t necessarily need to get his shots off first in order to hurt his opponents. He’s the type of guy that likes to land counter shots when his opponent is landing, and he’s dangerous in the same way that WBA World super bantamweight champion Guillermo Rigondeaux is dangerous with his counter punching. Matthysse has basically beaten everyone he’s faced thus far during his eight-year pro career. He has two losses on his resume to Zab Judah and Devon Alexander but few boxing agree with those decisions. They feel that Matthysse deserved to win both of those fights, which were a case of Matthysse fighting Judah and Alexander in their hometowns instead of in a neutral venue. Olusegun is a tough fighter and likes to throw a lot of wild shots. However, he’s never faced anyone even half as good as Matthysse and this is going to be a major step up in class for Olusegun to be taking. Olusegun is unbeaten, but he’s not faced anyone of real quality during his 11 year pro career. Thus far, Olusegun’s best opponent of his career is 21-year-old Ali Chebah, who he beat by a 12 round decision last September. Matthysse likely would knock Chebah out in four or five rounds at best. Matthysse defeated Humberto Soto by a 5th round stoppage in his last fight in June. It was shocking to see how easily Matthysse was able to beat a very good fighter in Soto with ease. Olusegun could be a problem for Matthysse if he’s able to outwork him with his constant punches. However, Olusegun is so wild and raw that he’s going to be leaving a lot of openings for Matthysse to land counter shots and hard punches to the body. Olusegun will have problems with these shots if he doesn’t lighten up and fight conservatively. That he likely won’t do. For this reason, I see Olusegun getting knocked out on Saturday night in a one-sided fight from start to finish. Look at is another DeMarcus Corley type massacre for Matthysse. 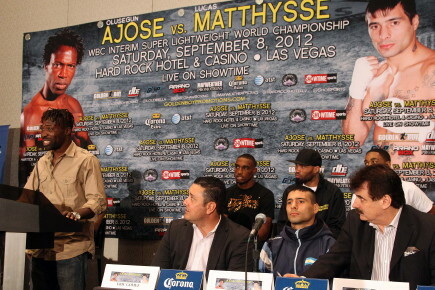 Corley was knocked out in the 8th round last year by Mattysse after being knocked down eight times in the fight.